After three hours in the zone killing every mob (including all the nameds) I've gotten the Stein and the Torch, but still no broom. I assumed that a 69 monk would tear through this and find a "common" item in no time at all. Guess what assuming does is true! got this off Ekeros in the jail in Najena. Easy. Just took a broom from a darkbone skele in Najena. Kheddar, 70th season Shaman Barbarian, Fennin Ro. Hiddenhere, 46th season Druid Halfling, Fennin Ro. Shardruin-40th season Shadowknight Ogre, Fennin R.
Captinundapantz, 36 season Iksar Monk, Fenin Ro. Also, on Combine server, Kheddar, 49th season Barbarian Shaman, Aaten, 8th season Erudite Wizard. RE: where u get one of these? I just got one off of an Alligator right in front of the bridge crossing the river to Cazic. Where are the gators now? I have been looking for this, i killed many fellow magicians in Najena and nothing, i will buy this, send a tell to Nindyen on the Tribunal. now is it frost giant toes or ice giant toes tat you need? if the magicians have these items on them can u see em or are they just in the general inventory? No. 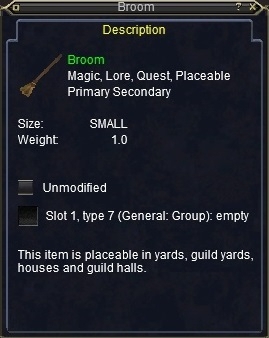 I loot a broom in Najena twice, but I could not found it until attempting loots them. It will make a magician looks like as a witch if it were shown. Yeah, it is not other than a broom. Is the items specified to get the broom stein torch and shovel no drop you know the ones u have to get identified are they no drop? They are NOT no drop. You can trade them. The broom stein torch and shovel are NOT nodrop, however one they are made into focus items they become nodrop. The broom, stein, torch and shovel are all dropped by the magicians of Nijena and the gators of Cazic Thule. Not all mobs drop items, in fact I brought my spit with me and cooked up some gator snacks from the insane number we slaughtered. The shovel drops most often, the stein and Torch are more rare, the broom is the rarest of the four. Get ready for an extended camp, bring some friends and group with other mages. You will get what you need eventually. The other items you need are jewles (all available from the jewler in Freeport, Qeynos or elsewhere for a modest fee of 60-120pp each) The mermaid scale drops off level 12-14 sirens in the ocean of tears, very easy kill and a common drop. (I killed 4 and got 2) The fire drake scale drops from a fire drake in Lavastorm, these are very easy kills. I would guess about lvl 12-14 or so. A griffin feather is a slightly rare drop from griffin/on/ennes in Karana, the lower lvl griffs are easy kills, CON before you attack. I killed 12 or so to get 3 feathers, one for each mage and one for my fleeting quiver *GRIN*. You will also need an eye from a gargoyle from Mistmoor. These are easy kills at lvl 29+, in fact I gathered several stacks while hunting for granite for my pally quests. They sell to merchants for 11pp each, so keep those extras :) Mistmoor is heavily guarded by caster Dark elves, but there are two low lvl gargs right inside the enterance with a few lo wlvl casters. Should not be a difficult challenge for a small group of 30s. Just watch for trains, the high lvl casters in the castle made a mess of a lvl 40-45 group while I was there last time. Easy hint for those who want to avoid mistmoore castle. The gargoyles on Spectre isle in OOT drop gargoyle eyes as well. The spectres spawn in the middle of the island, and don't wander. Stay near the edges, and wait for the gargoyles to come to you. they do wander. A couple of teen level characters could easily take these ones. what class do you have to be to use the broom? are the torch, broom , shovel and stein no drop? Once you hand in all the quest items (shovel, hill giant toes, ruby and gargoyle eye) you get back a No Drop focus item (i.e. Shovel of Ponz). But the original items (broom, torch, stein and shovel) themselves are NOT no drop. Ruby, Cyclops toes, and a broom from the Magicians in Najena. emerald, Fire Giant toes, and a torch from the magicians in Najena. Hill Giant toes, and a Shovel from the magicians in Najena. what Level are the magicians and alligators? Magicians are around level 20. Alligators are a few levels higher. Magician of the (long)35th season. #Anonymous, Posted: May 04 2001 at 5:17 AM, Rating: Sub-Default, (Expand Post) I would also like to know the samething! where u get one of these?